Mark Kristoff has rare-earth minerals in his blood. His father was an executive with Molycorp, which owned and operated the biggest American rare-earth mine, near the Mojave Desert town of Mountain Pass, Calif. When Kristoff was a kid, his father gave him a tour of the mine in full production, at a time when the U.S. was a global leader in the mining of rare earths  a handful of metallic elements that are minor but key ingredients in electronics. In the mid-1970s, it seemed impossible to imagine that the U.S. would one day be dependent on imports for the raw materials that made its high-tech industries go. "They were mining the elements that put the red in every color television," says Kristoff, the 49-year-old CEO of metal-trading company Traxys. But over the years, the U.S. saw domestic production of rare earths dwindle even as the metals became that much more important for high tech (think fiber optics and the iPad) and nascent clean tech (like solar panels and wind turbines). Tougher environmental rules and the costs associated with them led to the closure of rare-earth mines like Molycorp's Mountain Pass facility, while in China, low-cost labor and little in the way of government regulation meant that production boomed. Today China produces 97% of the world's rare earths. The vulnerability of the rest of the planet to Chinese dealers became apparent last year, when Beijing  allegedly out of concern for the environmental cost of mining  suddenly restricted rare-earth exports, sending prices soaring. Chinese leaders now say they'll cut the export quota for rare earths 35% over the first six months of 2011, threatening a shortage that could put the brakes on the U.S.'s green growth. "The problems are real and serious," says Robert Jaffe, a physicist at the Massachusetts Institute of Technology. "If appropriate steps are not taken, we face possible short-term constraints of supply to what could otherwise be game-changing energy technologies." Rare earths are rare in the sense that they are not often found in concentrations that are economically worth mining, though China, the U.S. and Australia all have major reserves. Despite their scarcity, rare earths have become a vital part of the global economy, and the gray and silvery metals are only going to become more valuable. For instance, iPods contain small quantities of the rare earths dysprosium, neodymium, praseodymium, samarium and terbium. Fiber-optic cables need erbium, europium, terbium and yttrium. Rare earths serve a number of purposes. Praseodymium is used as a pigment, while neodymium is a critical component of strong magnets. Rare earths are especially essential to clean-tech products, including solar panels, wind turbines and batteries. Each Chevrolet Volt  GM's new extended-range electric vehicle  uses 7 lb. (3.2 kg) of rare-earth magnets, while each utility-scale wind turbine uses 661 lb. (300 kg) of neodymium. As the clean-tech industry has grown and as China has curtailed exports, the price of rare earths has skyrocketed. 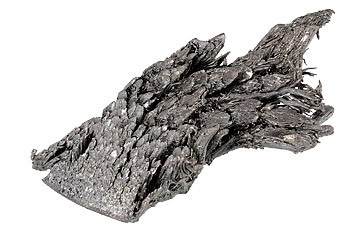 Dysprosium  one of the most critical rare-earth elements, with a name that means "hard to get" in Latin  has gone from $6.50 per lb. ($14.33 per kg) in 2003 to over $130 per lb. ($287 per kg). "Almost any clean-tech product or any electronic gadget needs these elements in one way or another," says Craig Cogut, founder of Pegasus Capital Advisors, a private-equity firm that has invested in rare earths. "They are absolutely critical to the growth of green tech and IT." If that's the case, why has the U.S., which as recently as 1995 was producing as great an amount of rare earths as China, all but abandoned the industry? The key reason is environmental. Mining rare earths and processing the ore can be a dirty, difficult business, in part because of the toxic acids needed for refining. At one point in the 1990s, the Mountain Pass mine was producing hundreds of gallons of wastewater an hour, mixed with radioactive elements from the thorium and uranium that are often found with rare earths. As U.S. environmental standards tightened, the costs of producing rare earths increased  even as domestic mines were undercut by Chinese producers who seemed to operate with little or no oversight. See photos of illegal mining sites in Venezuela.